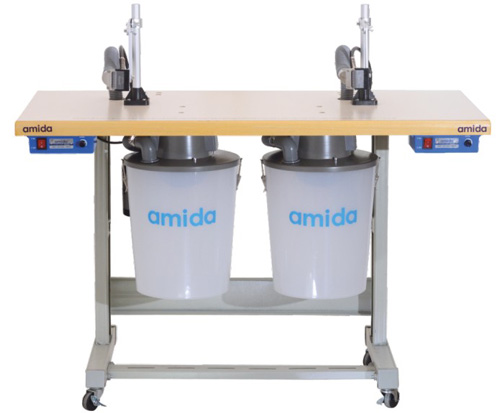 "Thread trimmers are functionaly mini vacuum cleaners that keep finished garments clean "
Amida's thread trimmer device are commonly used for knits and wovens as an additional attachment on the machine. They can be used for any brand of machines available today or kept on separate tables as an individual workstation. They are very reliable because of their advanced mechanism and material construction with complete warranty and guarantee for one year through IIGM's Prefered Service Programme. Trimming thread ends and collecting waste with the same pace has never been this easy. It reduces trimming cost and there is no need of any manual intervention. Provides clean and comfortable working conditions. Also provides same trimming quality for the garments without damage. Easy to operate or move around on the shop floor. *NOTE: Thread trimmers come in a fixed style with single or double head and with a swirl motor as an option. "Pl know actual price with g s t. "
"I NEED QUOTATION FOR THIS MACHINE"
"I went same thread trimmer m/c spare parts control box & sucktion motor"
"Please need head thread trimmer. Can you sent e mail price please or we chat .rayand1977 Thanks"